show that inaccurate data has a direct impact on the bottom line of 88% of companies. In fact, the average company loses 12% of its revenue due to bad data. As you know, Google Analytics is a powerful product with a wealth of features to help you optimize your results online. However, to unleash the power of Google Analytics’ marketing tools, you must ensure the data collected is complete and of the highest quality. The insights that fuel action in Analytics depend on good data, especially for some of our advanced algorithmic marketing functionalities like data driven attribution. Since its release two months ago, our popular new diagnostics tool is working hard to ensure you’re getting the best results. Today, we’d like to share insights into some of the most common account errors along with likely causes and suggested solutions. In particular, we’ll look at some solutions for when our diagnostics tool is telling you the following: “Bad Default URL,” “Clicks and Sessions Discrepancy,” and “No Goal Conversions.” Read on to understand the impact of these issues as well as their common causes. When you create a Google Analytics account for website tracking, one of the first questions we ask is for a default URL. This is generally the homepage of your website. Diagnostics ensures that you have tagged your default URL correctly for this property, and warns you if this is not the case. Having a properly tagged website is an essential step towards being able to understand consumer behavior. This warning is generally caused by either missing or malformed tracking code installed on your default URL, or more simply a typo in the URL that was input. If the default URL is incorrect, simply login to your Google Analytics account, click the “Admin” button in the header, and click “Property Settings” to adjust your default URL. If the tracking code is flawed, you’ll want to talk to your webmaster and ask to have the tracking code correctly installed. Beyond the default URL, we also check for tracking code health across your site. We look for pages that have missing or malformed tags. And we continually run these checks, ensuring new pages you launch in the future also are properly tagged. "Diagnostics helped me identify and fix an AdWords data discrepancy in my account. Without the tool, I may have never even realized that my data was inconsistent. This is a great tool!" Google Analytics offers rich capabilities that help users share data with linked AdWords accounts and gain unique and powerful marketing insights. It’s common to expect the number of clicks you see in AdWords to match the number of sessions you see in Analytics; but this is not always the case. This discrepancy can slow down meaningful analysis, and is a situation that can and should be rectified. The most common causes of this issue have to do with your configuration settings. For example, when you send ad clicks through a third party that redirects to your site; the third party will often times drop vital tagging parameters which are mandatory for Analytics and AdWords to associate clicks and sessions. Other examples are having AdWords auto-tagging disabled, and redirecting users to mobile sites while unintentionally dropping tagging parameters. Fixes for these issues can vary; we have a detailed guide to walk users through this or you can follow prompts in Google Analytics when we identify specific actions for you to take. If you have a third party who uses redirects and drops parameters, talk to them to resolve the issue. If auto-tagging is disabled on your AdWords accounts, consider enabling it. 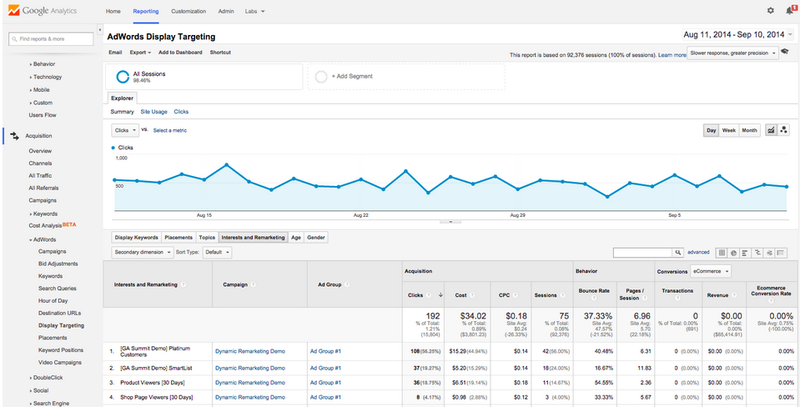 Google Analytics goals offer valuable ways to identify, track, and help you drive more valuable outcomes. Sometimes goals can break, and stop this critical stream of insights from reaching you. We run diagnostic checks to ensure your goals continually identify a steady flow of high value customers, and we warn you if this flow breaks. The most common cause for goal breakage is when a goal is based on a URL that changes. If your webmaster updates the URLs on your site, and the URLs in the goal settings aren’t updated accordingly, this will cause your goal to stop tracking. The second most common cause for goals breaking is if the event tracking on your site changes and the events listed in the goal aren’t updated accordingly. If you’ve had a goal break for these reasons, visit the “Admin” section via a link in the header of your Google Analytics account, and click “Goals” to correct your goal configurations. 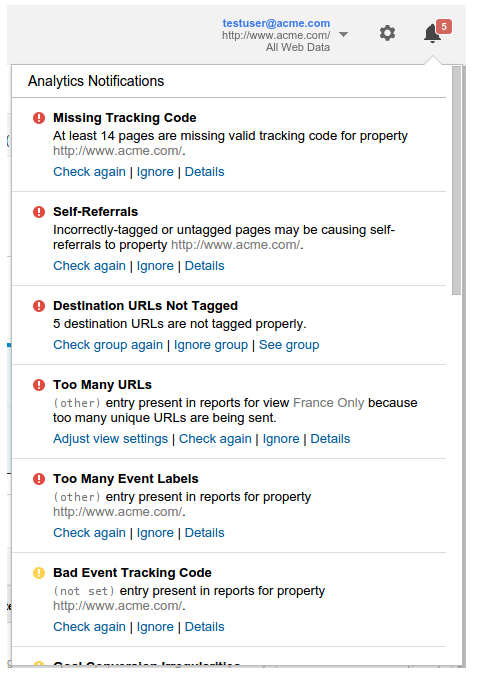 Google Analytics Diagnostics scans for problems every day (with some exceptions). It inspects your site tagging, account configuration, and reporting data for potential data-quality issues. Only users with Edit permission can see and respond to diagnostics messages. Diagnostics honors the first response to a message; for example, when a user ignores a message, it is ignored for all users. The tool currently scans for dozens of issues, and dozens more are planned. Just keep an eye on your account over time - it will notify you if and when new issues or opportunities are detected. Good data is important. How important? Studies show that inaccurate data has a direct impact on the bottom line of 88% of companies. In fact, the average company loses 12% of its revenue due to bad data. As you know, Google Analytics is a powerful product with a wealth of features to help you optimize your results online. However, to unleash the power of Google Analytics’ marketing tools, you must ensure the data collected is complete and of the highest quality. The insights that fuel action in Analytics depend on good data, especially for some of our advanced algorithmic marketing functionalities like data driven attribution. 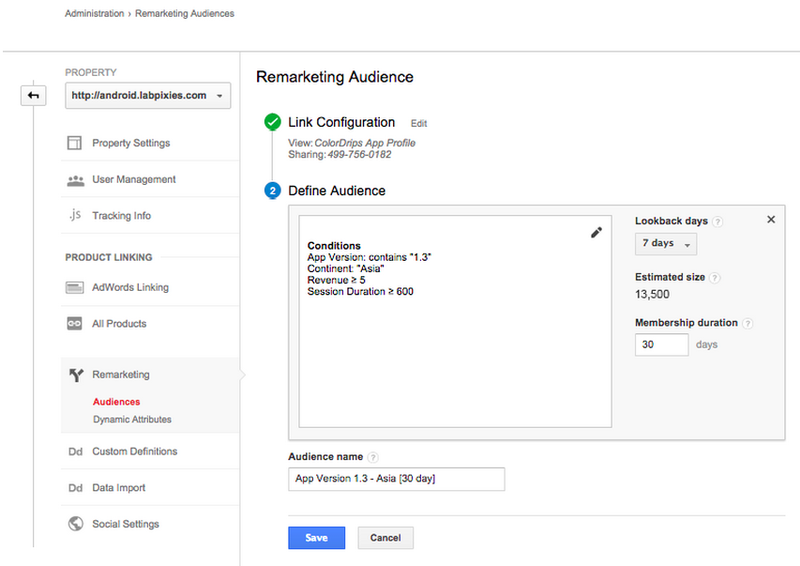 and Remarketing are now available for apps in Google Analytics. Just one of the improvements for audience segmentation and remarketing we're announcing today, these changes should make it even easier for all our advertisers to reach their high-value customer segments. Now developers can see just how different user segments engage and monetize with In-App Audience Demographics Reporting. And it's more than just data. Analysts and developers can blend audience demographic and behavior data into detailed audience lists to be targeted with in app remarketing campaigns. In short, all the great remarketing capabilities for Google Analytics users on the web are now available for apps as well. Creating remarketing lists for apps and web is now even easier with recent upgrades to both segmentation and audience building. A streamlined creation flow for creating audiences allows users to go from segment to audience within clicks (plus a few bonus admin features like list renaming and automatic list sizing). If you prefer to stand on the shoulders of remarketing giants, Analytics power users have developed and shared audience definitions that import via template links or from the solutions gallery. This simplifies things dramatically for new users. A process that could be complicated and time-consuming can now be done with 6 clicks in under 1 minute. Give it a try: import our Engagement Pack of Core Remarketing Lists. On the segmentation side, users have told us they wanted segments to be more discoverable, easier to manage, and more intuitive to build. We've been listening, and have made interface improvements, adding a simple “Add Segment” button within reports, a new segment-selection interface, hover-over segment definitions, and a 1-click action dialogue to Share, Edit, Copy, Remove, or Remarket to a segment. Once you’ve found a segment, created an audience, and activated your remarketing campaign, close the loop by measuring the performance of those audiences across all remarketing campaigns . Enter the new Adwords Display Targeting report in the Acquisition section to see all your active remarketing lists, along with impressions, spend, behavior, and conversion rates under the “Interests and Remarketing” tab. You can learn how to update your SDK to enable these features in our Help Center or get started now by creating some remarketing lists. We hope that these improvements make your audience segmentation and remarketing-- in apps and on the web-- more intuitive and more effective. We’d love to hear from you! Please leave questions or feedback in the comments, and stay tuned for more audience-related improvements. Good news for mobile app developers: Audience Demographics and Interests Reporting and Remarketing are now available for apps in Google Analytics. Just one of the improvements for audience segmentation and remarketing we're announcing today, these changes should make it even easier for all our advertisers to reach their high-value customer segments. in Google Analytics will help you find out. The new Benchmarking reports display acquisition and engagement metrics — like sessions and bounce rate — by Channel, Location, or Device Category dimensions. To ensure total data transparency, the number of properties contributing to the benchmark is displayed once you choose the industry, market and size. A helpful heat map feature makes it easy to see areas of strength and opportunity, and where to devote more resources. Twiddy.com, a vacation rentals company in the Outer Banks-- a popular summer getaway destination-- has been using Benchmarking reports to help focus its marketing resources. A look at their peer benchmarks by channel showed that Twiddy was doing many things well during its peak summer booking season. Still, “it was clear we were missing a huge opportunity in email marketing,” reports CMO Ross Twiddy. His team used Google Analytics data to revamp their email marketing and improve the flow and process. Email opportunity: Visitors from email spend nearly twice as long on site as the average, but user sessions generated from email are 82% below average and new users from the channel fall 91% below similar sites. 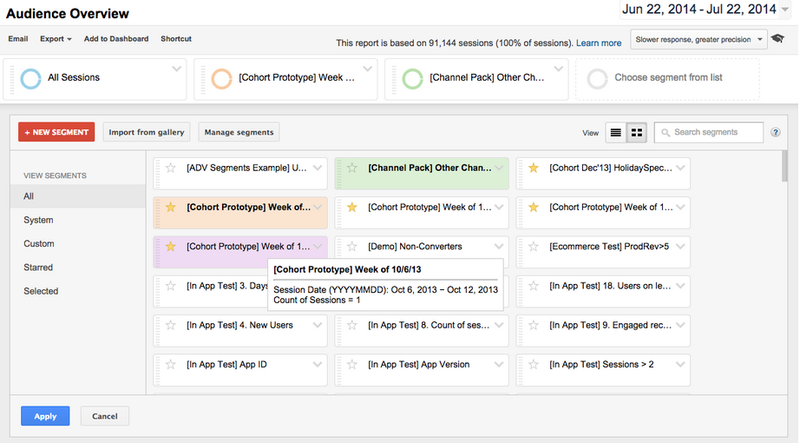 Twiddy even used Google Analytics to choose the best-selling messages for their email campaigns. Their analysis helped them zero in on the factors that were most consistent in repeat bookings: the price range, location, rental type, and even vacation week that would be most likely to convert with for each customer. "We launched an email last week based on our findings, and it shattered our email marketing records: a 48% average open rate and a 40% clickthrough rate,” says Ross. Benchmarking reports can be found in the “Audience” section of the reporting interface and are rolling out over the next few weeks to all Google Analytics users who have opted in to share their data anonymously. If you want to join in, simply check the “Share anonymously with Google and others” box in the Account Settings tab of your account admin page. 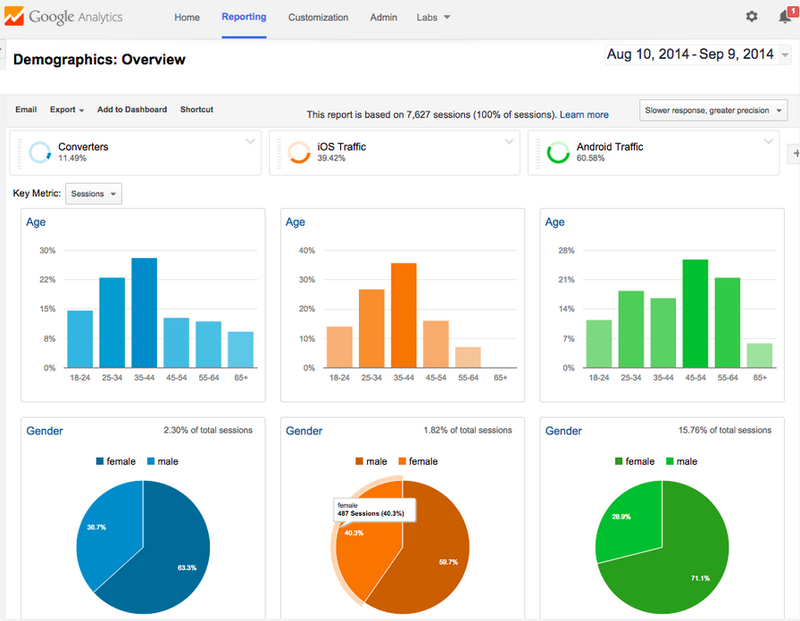 This is only the beginning for benchmarking within Google Analytics. We’ll be expanding these capabilities in the coming months, both incorporating conversion metrics and adding support for mobile apps. For more information on Benchmarking reports, check out our Help Center. 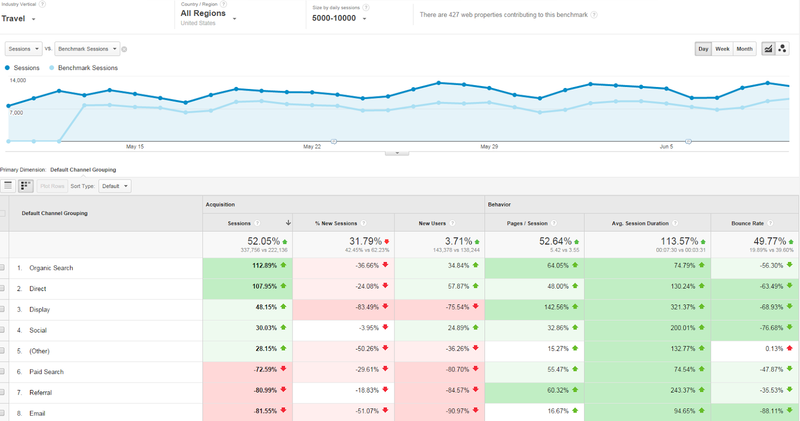 If you’ve ever wondered how your website is performing compared to the competition, our new Benchmarking reports in Google Analytics will help you find out.